I adore Scrivener. So much, in fact, that I’m writing my thesis with it. As part of my series on my Scrivener to LaTeX workflow, which really takes advantage of the best features of both approaches, this post focuses on writing a literature review in Scrivener. Such a task requires handling large amounts of abstract information and moulding it together to form a broad yet coherent narrative. Scrivener is perfectly suited to this kind of writing, academic or otherwise. Previous posts have covered how to use MultiMarkdown to include citations, LaTeX math mode code and generic LaTeX code. However, writing the required tags can be cumbersome and can disrupt the writing process. Using the Replacement feature, custom tags can be used for a more streamlined writing experience. 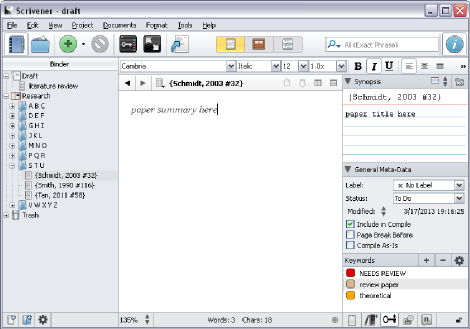 Whilst the text will remain as typed in the Scrivener document, when compiled the required substitutions will be made. As noted in an earlier post, using math mode in Scrivener is very easy. Using MultiMarkdown – which can be found here – the MultiMarkdown to .tex compiler recognises the syntax and performs the conversion seamlessly. However, for more complex LaTeX code, there is another route. This post describes how to insert any LaTeX code in the body of your Scrivener document. Again, we use the MultMarkdown to .tex compiler so that any formatting in the document is preserved, but we take advantage of the ability to direct the compiler to process text in HTML tags. Much of the preparation I do in the lab is routine. Every other day I make up a solution containing exactly the same components: x mL of water, y mL of stock solution, and- wait, how many grams of z? No matter how sure I am, that creeping doubt sends me flicking through the pages of my lab book, searching for that one line with the correct amount. 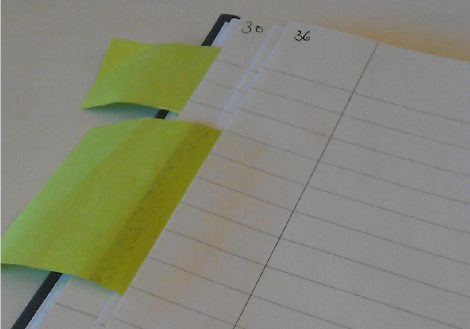 Finally, I have found a use for Post-it notes beyond jotting down important things that will inevitably get lost. There is plenty of room on a Post-it note for key details – like ‘n g/mL of y‘ and ‘use program 3’ – or at least a bookmark for a more detailed protocol. By sticking the note in the margin so that the body hangs out from between the pages, information that is required every day is immediate accessible.Now, when the mid-measurement paranoia sets in, the important details are readily visible. Important protocols and my current page are bookmarked. It really is a simple solution to a silly problem. But the PhD is difficult enough, and I’ve decided there’s nothing wrong with taking steps to make it a little easier, however small the step! This post looks at how to get feature-rich text (including citations and formulae, for example) into a LaTeX format. MultiMarkdown must be installed, as this is how Scrivener converts the text into the LaTeX format. I use LyX as a graphical interface to format my LaTeX files, but this is a universal method since the way to generate the .tex file is independent of LyX. The citations must be in a compatible format. For this, I convert my Mendeley bibliography to a BibTeX file, covered here. This post shows hows to insert references in to LyX using a .bib formatted bibliography. Mendeley is my reference manager of choice, but for use with LaTeX the bibliography should first be converted to a compatible format. I use the BibTeX format, and use JabRef to edit the .bib file. In theory, the file should not need too much editing after exporting from Mendeley, but sometimes accented characters get lost. Integrating reference managers with Scrivener is very simple, so that citations can be added quickly and easily without disrupting the writing process. However, whilst some formatting options are available for the final document, the main purpose is content generation. Rather than being a standalone program, for a polished-looking document it is often easiest to format it elsewhere. Below is a quick guide to inserting references into a Scrivener document, and exporting the text for formatting in Word. (onhavingwords.wordpress.com), 2012-2013, unless otherwise stated. All rights reserved.